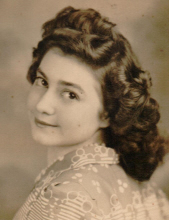 Lucille Margaret (Brunk) Flory, 96, of Bridgewater, passed away Saturday, April 13, 2019 at her home. She was born in Harrisonburg on March 8, 1923, and was a daughter of the late Lewis Samuel and Eva Margaret (Liskey) Brunk. Lucille was a lifetime member of Dayton Church of the Brethren, where she served as a deacon emeritus and was in the women's fellowship circle, Friendship Sunday school class, and participated in the bible study group. She graduated from Dayton High School, class of 1939. She was united in marriage on July 28, 1944 to Jacob Carson Flory, who preceded her in death on December 2, 2011. She was his partner on the family dairy farm until their retirement. She is survived by her children Marsha Flory Smith, of Bridgewater and James Carson Flory and wife Carrie, of Dayton; a brother, Golden Brunk, and wife Sylvia, of Harrisonburg; sister-in-law, Elizabeth Ann Kinzie, and husband William "Bill", of Richmond, and brother-in-law, Lowell Texiere of Bridgewater. She is also survived by four grandchildren, Ashley Smith, Jenny Anne Flory, Daniel Flory and Mia Flory, and numerous nieces, nephews, great nieces and nephews, great-great nieces and nephews, and a great-great-great nephew. She was preceded in death by her son, Wayne Dallas Flory, brother, Nelson and wife Mary Lee Brunk, and brother-In-law, Raymond Flory and wife Doris, sister-in-laws, Catherine Flory Wampler and husband J. Weldon, Margaret Flory Erbaugh and husband, Eugene, Ruth Flory Rhodes, and Evelyn Flory Showalter Texiere and husband Hubert Showalter. A memorial service will be held at 2:00 PM on Wednesday, April 17, 2019 at Dayton Church of the Brethren with Rev. Kevin Daggett and Rev. David Brunk officiating. Burial will be private. The family will receive friends from 6:00 to 8:00 PM on Tuesday, April 16, 2019 at Johnson Funeral Service in Bridgewater. In lieu of flowers, memorial contributions may be made to Dayton Church of the Brethren, P.O. Box 236, Dayton, VA 22821 or Central Valley Habitat for Humanity, PO Box 245, Bridgewater, VA 22812. To send flowers or a remembrance gift to the family of Lucille Margaret Flory, please visit our Tribute Store. "Email Address" would like to share the life celebration of Lucille Margaret Flory. Click on the "link" to go to share a favorite memory or leave a condolence message for the family.